We typically cook with brown rice and we have several preparations. Recently I decided to put together several preparations and see if we liked the result. It was a hit with the family and I think we'll do it again, though it does take some extra time. Add the spices to the cold water and add to rice. Bring to a boil then reduce heat, cover and simmer for 45 minutes. 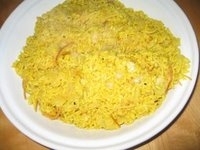 Place the vermicelli in a dry frying pan (no oil) and brown lightly. Be sure not to overcook them -- they turn brown quickly. I usually put the vermicelli to the side and add to the rice the last 10 or 15 minutes so they don't overcook.